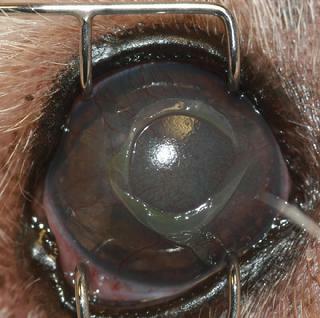 Corneal ulceration is classified as a disruption in the corneal surface. The cornea is the clear portion of the outer eyeball that allows us to see the iris and pupil. When the cornea becomes diseased or injured, ulcerations frequently develop and are very painful. Can ulcers be caused by bumping the eye? The eye is a very resilient structure, and is protected by the eyelids and the bony orbit. As we are aware of our eyes and their sensitivity, so are our companions. They have a blink response similar to our own which prevents most self inflicted injuries. However uncommon, mechanical ulcerations do occur, and treatments are available. My friend's dog had an ulcer that healed with eye drops, why does my dog have to undergo surgery? There are many types of corneal ulcers. Most superficial, mechanically induced ulcers will heal in 3-4 days with antibiotic therapy and pain medication. -Ulcers that stay on the surface of the eye for weeks, months or even years are classified as Indolent, non-healing ulcers. Indolent ulcers occur most frequently in Boxer dogs and usually develop spontaneously. The basement membrane of the cornea is defective and prevents healing. These ulcers require a minor surgery to repair the defective tissue. -In some cases, a small ulcer develops an infection and begins to "melt" the cornea. These ulcers are considered an emergency and medical intervention is always required. 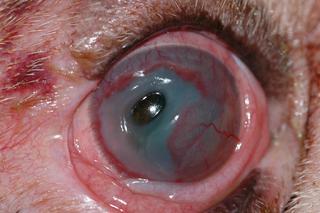 Corneal melting occurs rapidly, and generally continues in spite of aggressive medical therapy. The outermost layers of the cornea melt away, exposing the last layer (Descemet's membrane), which leaves a descemetocele. A descemetocele is a weak spot in the cornea, and increases the likelihood of corneal perforation. Once a descemetocele is exposed, or the cornea perforates, surgery is inevitable. Conjunctival graft surgery is the most common surgery used to repair a Descemetocele.